Gov. Jay Inslee wants lawmakers to focus this session on K-12 education, mental health and wildfire funding. But his State of the State speech also acknowledged there will be no full plan this year to resolve the state Supreme Court’s McCleary decision. OLYMPIA — Gov. Jay Inslee, gearing up for a renewed legislative push in an election year, urged the Legislature on Tuesday to focus on K-12 education, mental-health services and wildfire funding. In his State of the State address, Inslee proposed that lawmakers raise beginning teacher pay to help fix a statewide teacher shortage. The governor also urged legislators to come up with a framework for K-12 investment, to dip into reserves to pay for 2015’s wildfire-fighting costs and to invest in the state’s mental-health system. On mental health, Inslee touted his 2016 supplemental budget proposal, which seeks to increase staff at state psychiatric hospitals and add mobile crisis teams to reach those in need. The governor’s plan would also spend more to keep people healthy enough to stay out of the hospital and in their communities. But the governor again faces a divided Legislature, with GOP lawmakers questioning some of his priorities. Republican legislative leaders Tuesday said new revenue — such as the four tax exemptions Inslee has proposed to roll back to fund his teacher-salary plan — should be a last resort rather than a first measure. One thing Inslee and legislative leaders in both parties have agreed upon: There will be no resolution this year to the state Supreme Court’s K-12 funding order known as the McCleary decision. In his address, the governor joined legislative leaders in acknowledging that this year’s 60-day session will not produce a full plan to satisfy McCleary. While the Legislature has increased funding, the court in August imposed a $100,000 per-day fine on the state for failing to come up with a full funding plan. With the black-robed justices watching on from the front row of the state House chambers, Inslee promised a first step toward the plan this session and to finish the task in 2017. Legislators last week issued a K-12 plan that is more of a plan for a plan. Among other things, it establishes an education-funding task force and calls for analysis of how school districts pay for teacher salaries. But the plan does not spell out how to end the school districts’ overreliance on local property-tax levies to pay for teachers and basic education needs. And in a legislative forum last week, lawmakers stepped back from last year’s consensus of a bipartisan group of state senators that put the price of such a fix at $3.5 billion every two years. The lack of a full McCleary plan proved too much for state Superintendent of Public Instruction Randy Dorn. Instead of taking his seat Tuesday with other statewide elected officials in the front row of the House chambers, Dorn stopped by and dropped a note on his chair. Dorn, a vocal critic of the Legislature’s approach to McCleary, has called education a civil-rights issue and said Tuesday that lawmakers have waited too long to tackle the problem. Instead of finding the billions of dollars it might take to pay for McCleary, lawmakers just want to “get through this session” and “get through re-election” later this year, Dorn said. Dorn wasn’t the only statewide official absent. Indicted state Auditor Troy Kelley — facing federal charges alleging tax evasion and money laundering, as well as calls to resign — also skipped the event. A spokesman said Kelley instead attended a regularly scheduled meeting at the Auditor’s Office. Although some lawmakers have pushed to impeach the state auditor, legislative leaders have not signaled that as a priority. 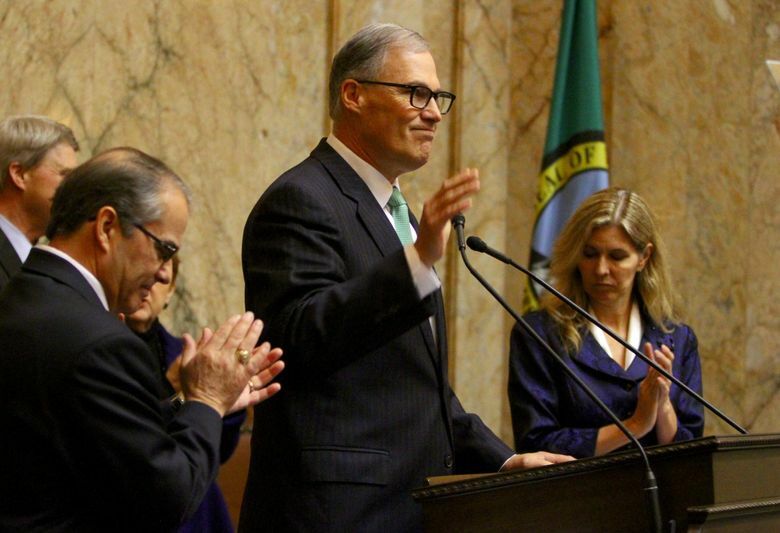 In his speech, Inslee neither mentioned impeachment nor spoke Kelley’s name. Republicans — who control the state Senate — pushed back on Inslee’s proposals on teacher pay and mental-health funding. Aside from opposition to raising revenue, Senate Majority Leader Mark Schoesler of Ritzville on Tuesday questioned whether the state could recruit new teachers even with a salary increase. “Even if we did have the money [teachers] may not be readily available,” Schoesler said. GOP lawmakers Tuesday also questioned spending more money on the state’s mental-health programs before determining how to successfully expand the system. Lawmakers this year appear to have little appetite to stay past the 60-day session. Last year, legislators endured three overtime sessions, and a stalemate over the state’s 2015-17 operating budget and other issues didn’t end until July. Their work produced a $16 billion statewide transportation package and substantial increases in education funding, including raises for K-12 school employees and state workers. The budget agreement also cut college tuition and poured new money into the mental-health system, which endured cuts during the recession. Along with his proposed 2016 supplemental budget, the governor this past month announced his plan to raise the state’s minimum annual salary for teachers to $40,000. That would boost pay for beginning teachers by $4,300 per year over what is already budgeted for the 2016-17 school year, according to budget documents. The governor’s proposed supplemental budget would draw $178 million from reserves to pay wildfire costs from this past summer. The budget also would boost funding for the state’s wildfire-fighting capabilities. Inslee’s speech Tuesday made quick reference to the Department of Corrections sentencing-error scandal. Those responsible for the problem — which allowed the mistaken early release of up to 3,200 prisoners since 2002 — will be held accountable, the governor said. With a nod to the fact that some Department of Corrections Inslee staff knew of the problem in 2012, Inslee on Tuesday appealed directly to state workers to speak up about problems in their agencies.